Tired of switching from one menu to another to perform a series of function? Want a menu of you own, with all the functions that you need or use often? Well, you can have one by using the CSS Horizontal Menu Generator. 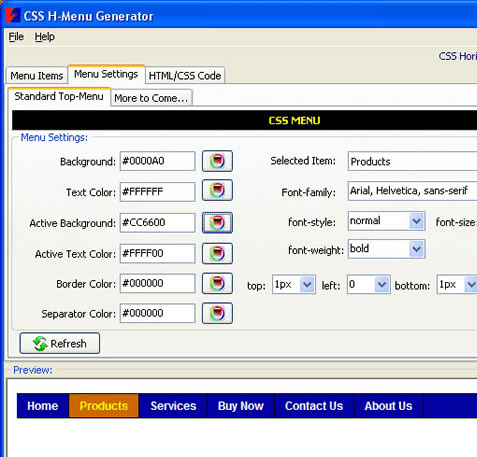 This software facilitates the generation of a WYSIWYG menu and is extremely easy to use. To create a menu, click on the Menu Items tab on the main screen and type in the items you want on the menu. Then, click on the HTML/CSS code tab and feed in or copy any code that you want. You can then customize the appearance of the menu by clicking on the Menu Settings tab. The Menu Settings tab has a variety of options to allow you to design your own horizontal menu. Here, you can select the background, active background, text, active text, border, and separator colors for items that you select from the Items drop down list. There are many font options available too, ranging from the font family to font style to font size to font weight. You can also set the position by selecting the desired values from the top, left, right, and bottom drop down lists. Once you have designed it, you can get an instant preview of your very own horizontal menu inside your program window itself. You can also set these settings as a template for future use. The only drawback o this software is that its interface looks very drab and uninviting. However, what it lacks in looks, the CSS Horizontal Menu Generator makes up in function and ease of use. All in all, the CSS Horizontal Menu Generator deserves a rating of 3.5 on a scale of 5.0 for giving the user to design his own customized horizontal menu.